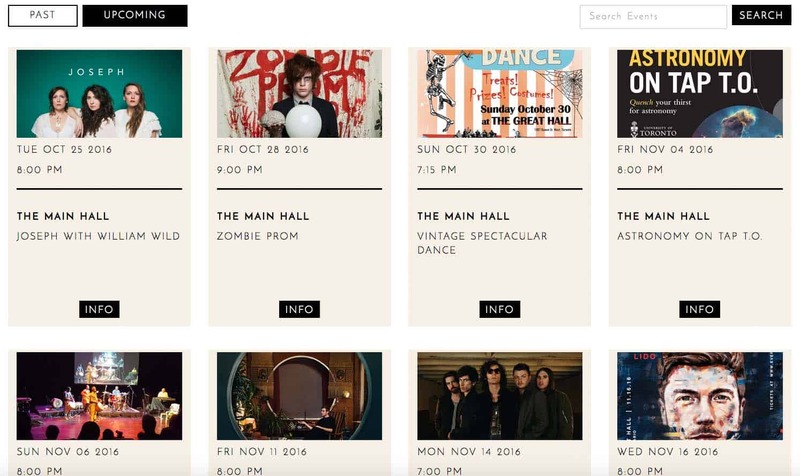 Complete ground-up web design and development for The Great Hall, a historic Toronto event and music venue originally built in 1889. The Great Hall approached us at the beginning of a major building renovation with the hopes of creating a concise web presence in conjunction with the completion of the massive renovation efforts. “Clean” and “modern” were words used often with the collaborative efforts to put together a brand new look & feel for the website. Beautiful photos were taken of each new space within the building in order to showcase the blank canvas potential available for private events. With new branding and a beautiful modern website, the client was very pleased to move forward with their new venture and to showcase the many spaces with a solid web presence. One of the main challenges of this project was creating a dynamic and easy-to-update event calendar system. The Great Hall has 4 main spaces that can each individually be booked for separate events. Instead of using an existing event system, we developed one in-house from scratch. This allowed us complete flexibility and freedom to modify and grow the system to the point where it fit the clients needs and expectations exactly. Some of the custom features include the ability to sort, search and feature the different events. Future features such as one-click ticket purchases and auto sharing across social media are planned.